When is a dog walk more than a dog walk? When it raises more than $8,000 to aid senior dogs in need. In September, The Grey Muzzle Organization received its biggest corporate donation ever, from HMS Helps, the community giving program of Health Management Systems, Inc. (HMS), a nationwide company headquartered in Irving, Texas. HMS presented Grey Muzzle president Julie Dudley with an oversized check at its keystone event in Irving, Texas, on September 17. “I am thrilled to be invited to attend this event, and congratulate HMS employees for helping the old ones who are left behind – dogs, and the people who depend on them for companionship, as well,” said Dudley. The mid-September event in Irving capped off a month of fundraising, as HMS offices across the nation pitched in to help senior dogs in need. HMS employee and New York Grey Muzzle volunteer Christine Saenz coordinated the national event. The top individual fundraiser nationwide was Debbie Smith in the Irving office, who made and sold buttons bearing the Grey Muzzle logo. 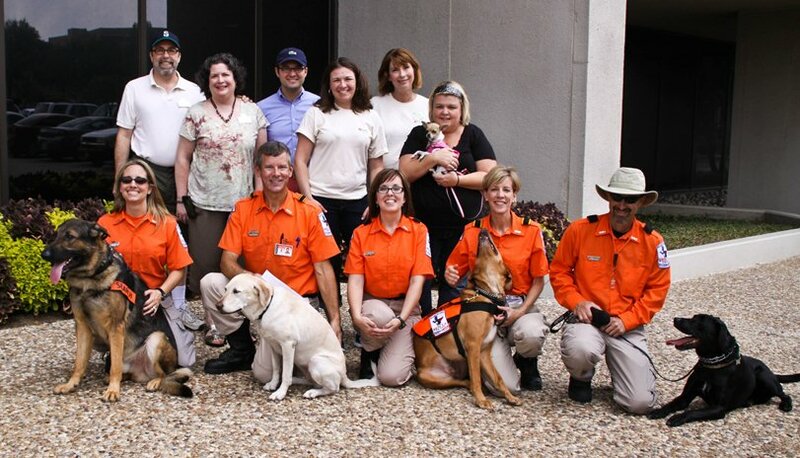 The fundraising effort had enthusiastic support from the top—the CEO of HMS, Bill Lucia, who encouraged employees to pitch in, has three dogs and two cats of his own, and calls Grey Muzzle “an organization that is near and dear to my heart.” He opened the grounds of the company’s Irving, Texas headquarters to a day-long event on September 17 that featured a dog walk, “pooch party,” live band, face painting for kids, demonstrations of dog sports, grooming 101, dog dancing, and “hide and seek” by SearchONE Rescue Team, a Dallas/Ft. Worth-based leader in the search and rescue community. Irving employees also collected donations of food, bedding, toys, and other goodies for Operation Kindness, the oldest, largest no-kill shelter in north Texas. Several dogs from the shelter were on hand at the Irving event. Where better to find a new Person than at a party filled with dog lovers? Grey Muzzle president Julie Dudley, who attended the event with her husband Barry, said it was wonderful to see so many people come out to support senior dogs. The Irving office won this year’s fundraising drive, bringing in more than $2,000 for the cause and winning the opportunity to host the event again next year. "In the current economic climate, we've had to work very hard to keep enough donations coming in to support the wonderful organizations who are willing to help senior dogs. To get this kind of commitment and support from HMS employees around the country is the kind of motivation that keeps us going," says Dudley, "Thank you doesn't really seem to cover it..."
Back, left to right: Barry & Julie Dudley of Grey Muzzle, Rea Grainger (2011/12 HMS Helps Co-Chair, Irving Chapter), Christine Saenz (HMS, New York), Niki Love (Sr. Operations Director, HMS, Irving), Debbie Smith (2010/11 HMS Helps Chair, Irving Chapter).